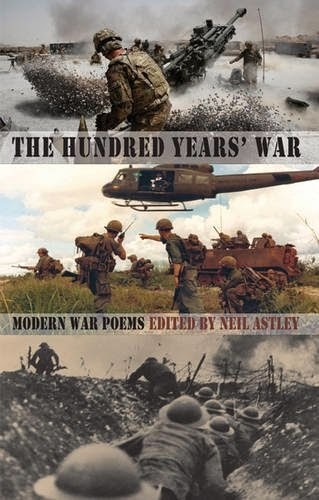 More than happy to have a poem in The Hundred Years' War anthology which is just out from Bloodaxe. Other contributors include: Anna Akhmatova, Yehuda Amichai, Guillaume Apollinaire, Simon Armitage, W.H. Auden, Ingeborg Bachmann, Aleksandr Blok, Johannes Bobrowski, Eavan Boland, Bertolt Brecht, Joseph Brodsky, Rupert Brooke, Ciaran Carson, Paul Celan, William Childress, Jean Cocteau, John Cornford, Mahmoud Darwish, Imtiaz Dharker, Keith Douglas, Helen Dunmore, Paul Durcan, Darwesh Durrani, Gavin Ewart, James Fenton, Carolyn Forché, Erich Fried, Federico García Lorca, Ivor Gurney, Choman Hardi, Tony Harrison, Seamus Heaney, Miguel Hernández, Zbigniew Herbert, John Hewitt, Geoffrey Hill, Miroslav Holub,, Randall Jarrell, David Jones, Brendan Kennelly, Philip Larkin, Denise Levertov, Primo Levi, Alun Lewis, Michael Longley, Robert Lowell, Louis MacNeice, Antonio Machado, Derek Mahon, James Merrill, Eugenio Montale, Paul Muldoon, Pablo Neruda, Wilfred Owen, Isaac Rosenberg, Alan Ross, Tadeusz Rózewicz, Siegfried Sassoon, Jo Shapcott, James Simmons, Boris Slutsky, Aleksandr Solzhenitsyn, Anna Swir, Wislawa Szymborska, Edward Thomas, Brian Turner, Giuseppe Ungaretti, , Bruce Weigl, W.B. Yeats & Yevgeny Yevtushenko.